Do you want to impress family and guests with your barbecuing skills? There’s nothing better, on a warm and sunny afternoon, than meat slowly cooking on a barbecue. Gathering family and friends around to share in your masterfully prepared feast is one of the great pleasures of summertime. Do you want to be able to cook perfect barbecue, every single time you light the charcoal? We reveal the essential Pitmasters recipes and techniques most used by both backyarders and competition teams. This is more than just a cook book. Sometimes the secret is more in the technique than the ingredients. Many of us just throw items onto a grill and hope for the best. With one click you’ll have easy to read, step by step, tricks in time to grill tonight, with The BBQ Blueprint. Where can you find the secrets of successful barbecuing? In this innovative barbecue book we go behind the scenes at the world’s most popular BBQ pits. You’ll read details about Scott’s BBQ and see inside the smoke house. Plus, learn about the underground charcoal roasting chutes at Charlie Vergos’ Rendezvous in Memphis (and get secrets behind the recipes). If you are venturing into new and unfamiliar areas of live fire cooking you will not be alone! 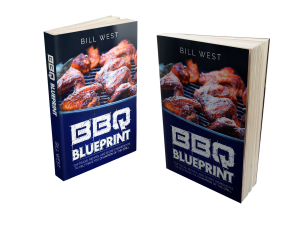 Author Bill West and The BBQ Blueprint will be with you every step of the way to help walk you through the entire delicious and fun process. It’s a book about learning, enjoying and above all, sharing. Click below and get The BBQ Blueprint now and you will also get exclusive access to our downloadable cook’s log for home and competition, a BONUS Sauces and Sides eCookbook, plus an additional free PDF pro competition gear checklist. Available in print and digital (color print and b&w interior). Kix Brooks has something special in the works! 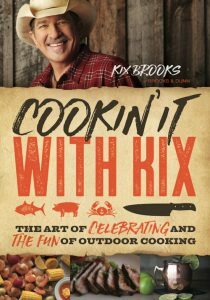 A new Kix Brooks cook book called Cookin’ It With Kix that we got to announce on our Country Cooks podcast a while back. The book is out now and I encourage you to listen to our coversation – the full text of it is also below. Bill: You hear Kix Brooks on the radio every weekend, and also the multiple…I was actually shocked to see, 26 ACMs, 17 CMA awards, a couple of Grammies, Kix Brooks knows his music. But today we’re talking about food, country cooking and what Kix Brooks has in the works. A Kix Brooks cook book. I’m in the studios of Nash FM, Charleston here, and also kind of in the studios of Nash in Nashville as well with our guest today Kix Brooks who’s the host of American Country Countdown, Kicking it With Kix, and also Steakout on the Cooking Channel, which I’ve been a real fan of, talking about food. I first was trigged to talk to Kix about steak out, but now I’m finding all these different connections with food. Kix Brooks hello. Bill: It’s going great. So tell me about where you got connected with food in the beginning? What’s your food story? Kix: Well I got hungry one day, and I was really inspired to eat. You know the short answer is I’m from Louisiana and I guess probably everybody that’s into cooking has some story about where they come from, but the way I grew up we were always had some pot of something cooking, and we were fishing and we were hunting, and we were cooking what we were catching and shooting in the woods, no matter what it was, and it’s even more extreme in South Louisiana, I’m from North Louisiana, but it’s hard not to be in that State and not grow up around a grill or a big pot of something going on. And it’s funny because it’s such a part of lifestyle as well, you know you’re just …you’re always hooking up with your friends, it’s like “Why don’t you all come over?” And it’s not “Let’s come over and watch a movie,” or “Let’s go do this or that,” it’s “What are we cooking?” And there was never anything chefy or frivolous or anything about cooking. Cooking was like a sport like football, if you didn’t know to cook growing up in Louisiana, you were lame. So it just kind of goes with the territory I guess is the short answer. Bill: Who was the big cook in your family? Kix: Well really my grandfather was really a good cook and could cook anything too. But you know we just… everybody kind of did it. My dad and I had what’s called a country kitchen, and when I say my dad and I, we both took ownership in it, but it was… we had a big like a big brick… when I say big, probably five by eight, about three feet high that had burners all in it so you could be boiling shrimp and frying fish and frying potatoes, had three burners in there. And then next to it we built like a little brick smoke house and it was about the same size with a hood, a little roof on it, and you could put slabs or ribs in there and whatever, and it was not uncommon at all, especially on the weekend for me to have 20 or 30 of my friends over just party and fishing, doing it all, but lunch and dinner there was always a big something cooking, smoking, frying, boiling, whatever. Bill: Yeah it sounds like, you know what I’m here in Charleston and I like to call this like the birthplace of barbecue but really there’s kind of a barbecue thing going on in Louisiana then from what you’re describing. Kix: Yeah absolutely. And you know barbecue’s a big word, whatever that means because you know I having traveled back and forth across America for about 20 years. Everybody’s got their barbecue and everybody’s got their steak, that’s what inspired me to do that steak house show because you’re off a tour bus you go “Where do you get a good steak around here?” And everybody’s got a story, “… and this place…” and a story about the place and then what kind of steaks they make and whatever, I’m like “God, you know you think there’s only one kind of steak,” but barbecues the same way. Tennessee barbecue and Louisiana you get barbecue, it comes in a thick barbecue sauce and whatever, you got to roll up your sleeves and stuff’s going all down both your arms and you’re just… it’s just delicious. But it’s a lot of stuff, first time I got barbecue in Tennessee it’s kind of like in Carolina that some of the barbecue I’ve had you know it comes with more of a vinegar kind of sauce or whatever. Now in Charleston you may be sloppier like we are in Louisiana. Kix: Yeah, okay see. And Texas you used to talk about barbecue well you’re talking about brisket and whatever like that. You know generally it’s not like pulled pork, not that you can’t get it down there but for them it’s all about chickens and brisket and that kind of thing. So it’s…in Memphis obviously, you got wet ribs, you got dry ribs. Everybody’s got their own take on this. Bill: So when it comes to Louisiana cooking in particular are you a fan of Justin Wilson? He’s like one of my favorite. Bill: When I think of Cajun cooking kind of stuff I think of him, and it’s funny I was just looking at the late Pat Conroy, just had funeral services for him over the weekend, but one of my favorite cookbooks is his cookbook where he really makes it, I mean he’s an incredible writer but he really makes it about South Carolina and all the food we have here. I always kind of thought of Justin Wilson kind of the same way. Now I hear you have got a cookbook coming out, what’s that going to be like? Kix: Well it’s sort of what I’ve been talking about and it’s kind of…it’s more about celebrating cooking. It’s not a foody cookbook, and by that I mean I’ve been to a lot of restaurants where you have something on your plate the size of a pencil eraser and it’s got 18 exotic flavors in it and you’re trying to pair it with four different kinds of wine. And you know that’s all cool and it’s interesting and I’ve had a lot of enjoyable evenings eating exotic foods, but this isn’t about that, this is about cooking and you can do this and it’s not just 101 boiling water. It’s got some really fun recipes that are a little deeper in the cooking scene, but it is about… cooking is something you invite all your friends over and you can do whatever, but it’s a social event, it’s the same reason I got into wine and not to tout this, but I have my own winery and I think a lot of people are intimidated by how to pair wines and food and that kind of thing. So this book gets into that as well because you shouldn’t be intimidated by any of it, it’s something that you should really just jump in with both feet and enjoy and you’re not going to screw this up, and don’t be afraid to buy three packages of chicken, it’s not that expensive, and try doing different things for dinner. And you go, “Ah I like this but if we did a little more this it’d be fun…” And it’s sort of about get into it, teach yourself, learn from here’s a few basic tips, here’s how you do this. So it’s not rocket science, it really is something you should get in your backyard and have fun with. Bill: I see you’ve got… it says family recipes alongside some of your personal stories. Is there one like recipe that you’re really excited to get out there and get in the book that comes to mind? Kix: Gosh, just you asking that question I would probably say red beans and rice. It’s funny I lived in New Orleans for about a year before I came to Nashville, and Monday was red beans and rice day and all the restaurants around New Orleans, everybody had their version of red beans and rice, and my version is pretty…I won’t say complicated, it’s got a lot of stuff in it. You know basic red beans and rice is really beans a couple of slices of pepperoni, you know it’s got some certain flavors in it and you put it on rice and that’s just kind of the easy cheap tasty thing to do. And my recipe has a lot of stuff in it, it has five or six different kinds of sausage and meat and whatever, it takes a good three days… our house smells like red beans and rice for three or four days when we do this. But it’s a family recipe that is fun to share and it’s something I usually do for Super Bowl or something like that where I got a bunch of people coming over and I got a huge pot full of this stuff. Bill: …and actually I was at a party, I guess it was you and Ron, must been at Ronnie’s barn for a country radio seminar, and I discovered, they must have had it in from one of the places in Nashville, tried it for the first time, Nashville hot chicken, and I’ve been a fan ever since. Do you have a recipe for Nashville hot chicken? Do you like hot? Kix: What did I say? Kix: Yeah, and I was just thinking about Randy Houser because this week he had …or last week he had a record that went number one, so he sent Hattie B’s hot chicken which is here in town, unbelievable yeah, and it’s like cayenne…sends you to the moon. Their mild chicken will set you free. So yeah, Nashville hot chicken’s a big deal. Bill: So have you had food products out before? Kix: No I haven’t really. Bill: Besides wine of course. Kix: Yeah yeah, we’ve been making wine for…we’ve even had grapes in the ground for about 15 years now, so our winery’s been open about ten years. Bill: Looking at the TV show, Stakeout, are you going to do some more of those? Kix: I’m not going to do Stakeout again but I’m actually in the process of developing another food TV show. So I think I kind of did what I wanted to with the steak thing, and I think we could probably go to some more steak houses, but you know I came away from that going “Okay I think we get the message here, maybe there’s something a little deeper,” and I’ve got something that’s in development right now, it’s food and music and I think it would be real fun. Bill: So talking steak though, do you have a summary of like what’s the perfect steak? Kix: Well I think the thing that most people who love to cook their own steaks, the thing that I came away with is, A) You can’t get the level of steak they have at great steak houses in your grocery store. You know they wet and dry age all those steaks but they start with prime beef and there is a difference between grade A and prime. And so their beef is really good when they start, and then some of these steak houses were dry aging, which if you don’t know, basically you hang up a big slab of beef and it molds and all the enzymes break down, and it’s real expensive in those steakhouse, you go “God, this is an expensive steak.” And the reason is they have to cut all that mold off and everything, so you only get half of the meat that you start out with if you’re that restaurant, but the meat that’s left is so flavorful and tasty. And that’s really the difference is what you start with. And the big takeaway for cooking is I think most people are really into marinating their own steaks and whatever and all that at home, and none of these great steak chefs marinated anything, it was all about having a great piece of meat. And again you’re not going to dry age at home, but if you do buy a great steak, what looks to be a great steak at your local grocery store, leave it in your meat drawer for a couple of days, and just sitting there and those enzymes breaking down for a couple of days will make a huge difference. And also if you do come home and cook it, make sure it’s not cold, I mean leave it out on your counter covered up for at least 30/45 minutes, just let it get room temperature. Those simple things make a lot of difference. And then salt and pepper is what all these great chefs do, they just salt and pepper their shakes put a good glaze on it, cook at the right temperature that you want, but then the sauce that they put on top of is what great chefs are all about. And they make these awesome sauces and they boil down wine and lots of great ingredients to make these reduction sauces that they pour on top of their steaks, and that’s what the chefs take great pride in is what their sauce tastes like and why it’s different from the next guy. Bill: Which is your favorite cut of steak? Kix: You know it depends on what day it is, it’s kind of like wine. For instance if I’m surf-and-turfing I’ll probably eat a filet, and that’s probably the only time. My wife and I had a couple of nice filets and we got some huge prawns, big jumbo shrimps the other night and cooked them and threw some bell peppers on the grill with them and just had a great surf-and-turf with a little broccoli on the side, great meal. But if I’m just going to eat a steak really going for it, I’ll either eat a strip or a rib eye, a bone and rib eye for enough flavor there, and I like some marbling. You know you got some fat in that meat I might cut some of it away, maybe, but that’s where flavors is at. you know when you’re looking at your steak in the grocery store you want some white in that meat if you really want all the flavor. Bill: Well you obviously… I can envision how you’re cooking at home in the kitchen. When you’re on the road do you get a chance to do any real cooking, or what’s your average food day like? I’m sure Vegas is different than being on tour, but you know is there a typical day on the road in food? Kix: It’s funny, when we toured we had grills under every bus and in the afternoons everybody had charcoals going. So one of my favorite tours was we co-headlined one year with ZZ Top, and Billy Givens was the guacamole guy, yeah the lead-guitar player with the beard, he was great. So we would have basically fajitas, and we would find whatever great steaks we could, strip or sometimes better cuts of meat and or chickens or whatever, but every day we had tamales going and Billy would make the guacamole and there’d always fajita meat going on the grill somewhere. So you could just wander around through the buses and get a pretty good meal. Bill: That’s the tailgate party I want to go to, Billy Gibbons and Kix and Ronnie and just all sorts of probably music in the background too. Kix: Absolutely. Somebody has got a guitar going. Bill: So yeah, tailgate party. Are you a tailgater? Kix: Oh absolutely. I mean football tailgater, and I always defend these songs you know when people start putting down Broke Country and all the songs about tailgates and bonfires, that’s how I grew up; and again we weren’t just burning wood and banging on guitars, we were cooking at the same time. It’s still fun, love tailgating before a football game, that’s just the way you get your energy going. Bill: So what would be on your tailgate menu and what would be on your tailgate play list? Kix: Well on my menu, I’m not a complicated tailgater, I don’t want to get into a bunch of difficult cooking, so whatever’s easy. You know kielbasa and sausages obviously come to mind, bruhwurst are awesome, doing festivals up north in Wisconsin and whatever. It’s funny, my son and I one day we got on our bicycles and there were bruhwurst stands, we saw like five different ones coming into this one festival we were playing at. I carried bicycles under the bus. Me and him went riding with backpacks and we got one of every different kind and came back and tested them all out, and I still ordered bruhwurst from that place. So I think tailgating again should be fun and easy and the cook shouldn’t have to work too hard, like hamburgers I think are kind of a pain because if I’m cooking hamburgers I’m putting cheese and onions and jalapenos and stuff in them. It’s okay to wrap something in bacon and throw it on there if you want something different, but that’s just my personal thing. I don’t want to work too hard if I’m tailgating cause something’s going to get screwed up. And music you know, I like to rock, but there’s some fun mainstays. I got to have some Steve Miller, stuff like that going in the background. Bill: That sounds awesome. You also cook with some wild game, I noticed I saw one of your post somewhere you were doing something. Is that your own stuff you’ve brought home? Kix: Yeah and I’ve learned a lot from cooks out there in the wild. I fish in Alaska every year and we do what are called “Shore lunches” to where basically they’ll either dig a hole in the ground or sometime they leave big kettle pots in the woods where we can go find them, and we’ll catch fresh salmon and go back there and they’ll bring enough ingredients, butters and lemons and a few spices and you got to have some Rosemary and Thyme, some stuff like that that you can just dump on. Brown sugar is great on fish, some people don’t know, and mayonnaise, which I know sounds crazy. Probably the best natural oil that you can cook fish with if you’re going to just like cook a shore lunch or something like that with trout or salmon and just put mayonnaise all over and it’s just a great oil but it’s easy to travel with if you’re traveling in the wild. And then on the grill, yeah I’m a big duck hunter and deer hunter, so love all kinds of wild game and there’s a lot of different ways to cook it and a lot of that stuff will be in the book. Kix: Yeah, we’re pretty much done with it. Bill: What was that process like? Kix: Well it was really fun. Donna Britt who produced my radio show, The Countdown, for a number of years, she’s out and she had her own cooking shows out west, and she’s back in Oregon now. When I was approached with doing this it was fun because I’d already…I’d been working on a book, just stories about my life and things that had influenced me and whatever which I thought was semi interesting is the reason it hadn’t come out yet because it wasn’t real interesting to me. Any way when I was approached after the steak show about maybe doing a cookbook I thought well maybe it would be fun to put all these stories because so many of them revolved around food and how I grew up and that kind of thing. So Donna was the perfect person, she’s a good writer and very organized, and I called her up said “Hey you want to help me all this stuff together?” And she said “Yeah,” and she’s a good cook so she was the perfect person to help organize the recipes and get some great pictures. And so I think the book will be really fun, it’ll have some good pictures, hopefully some things that I grew up learning that will matter and a lot of fun cooking stuff that I think people who already like doing outdoor cooking might get some new ideas and people that may be intimidated by cooking might read this book and go, “God I can do this,” that’s what I really hope. Bill: Well I look forward to seeing like the stories in between too because that’s like I mentioned, the Pat Conrad book, I loved the personal anecdotes around some of the food recipes and the food stories, and from what you’re telling me it sounds like you might have a little bit of that in there too, which would be really cool. Kix: Well good. I hope so. Bill: Alright some quick questions and then I’ll let you run here. Kind of almost rapid fire you can give me as much or as little as you want. The best barbecue out there in the United States? Kix: The best barbecue? I’m a big rendezvous fan and Memphis, Tennessee I don’t think you can go wrong if you don’t know much about barbecue. We’ve got a place called Martin’s here, I would say rivals anything I’ve ever had anywhere, it’s for something that’s different, not your traditional barbecue. And they’ve got brisket tacos and a lot of different stuff, but Martin’s is awesome. You ask anybody in Nashville where the best barbecue is, most of them will say Martin’s. Bill: I would, and rendezvous is the top of my list too, so I’ll have to try Martin’s. Favorite cheese? Kix: Ooh. Boy that’s a good one. And again, depends on what you’re eating, that’s kind of like wine, I mean if I’m on lettuce it’s blue cheese but I love like white sharp cheddar cheese if I’m just coming in in the afternoons and putting something on a cracker and having a cold drink at the end of the day. Bill: Best place to get a hot dog? Kix: Well that would be a baseball park, probably Wrigley Field. Actually I know my producer’s in there looking at me right now because Dodger dogs are…I’ve heard of Dodger dogs all my life and first Dodgers game I went to I had to get one and they actually are all beef and they taste really good. Bill: Alright, so how do you like your steak? Kix: I like my steak medium rare. I think anything past medium you’re wasting it. Bill: Your favorite chef, either TV, home, or restaurant? Kix: Ooh, I got to go with Chef Sichel at Galatoire’s in New Orleans. Bill: And finally, your favorite I’d say country song? Kix: My favorite country song? Hank Williams, He Stopped Loving Her Today. Bill: Kix Brooks, American Country Countdown and with a new book coming out, Cooking With Kix, The Art of Celebrating the Fall and Outdoor Cooking. August 30th is the set date. Kix: And it’s not Hank Williams, it’s George Jones, He Stopped Loving Her Today, but I was thinking, I Can’t Help It If I’m Still In Love With You, Hank Williams. Kix: But you know that was probably my favorite artist and my favorite song all together. Bill: I should’ve caught that one…fellow disc jockey. And of course the book of course American Country Countdown, every weekend you’ve been doing that since 2006. Kix: Yeah I know, long time. Bill: We’re getting up… so this is the 10-year anniversary. Kix: It is. God I can’t even believe that. I can’t believe you guys will let me talk on the radio that long. Bill: We enjoy it and we love hearing all the anecdotes, and I can’t wait to see the book and get more from you down the road. Kix Brooks, thank you buddy. Kix: Well Bill, thank you.